Deedwana/Jaipur: The protest which had begun after the encounter of gangster Anand Pal Singh in Rajasthan has turned ugly on Wednesday. The supporters and the family who had gathered at Deedwana, near Anand Pal’s house to pay tribute to their ‘Robinhood’ and demanding an inquiry by none other than Central Bureau of Investigation (CBI), attacked policemen soon after the event got over. They even torched their vehicles. In the incident, one civilian Lal Chand was injured and has succumbed to his injuries. However, neither police nor Rajasthan Home Minister Gulabchand Kataria confirmed how he died, whether from police bullet or not. The home minister also refused the demand of CBI inquiry for the encounter, claiming that police has done its work honestly. Twenty one policemen who got injured in the clash, and among nine received serious injuries are under treatment at the SMS Hospital, Jaipur. Other than Lal Chand, three civilians were also injured and getting treatment along with policemen. A policeman Mancha Ran and a civilian Mahendra’s condition are critical. Both are in Intensive Care Unit (ICU). There are reports of Superintendent of Police Paris Deshmukh’s vehicle being set ablaze. In this incident, a woman probationary Indian Police Service (IPS) officer Monika Sen went missing for sometime but was found later. ADGP NRK Reddy informed that police had to use tear gas to disperse the crowd. Police has also imposed 144 in four districts of Rajasthan, and internet services have been blocked. While, at the native village of Anand Pal in Nagaur district, police clamped a curfew. Anand Pal, was killed in an encounter on June 25 itself, but his dead body is yet to be cremated. The family is demanding a Central Bureau of Investigation (CBI) probe. His corpse has been kept at freezer at Anand Pal’s house in Deedwana. Earlier also, after the encounter, his supporters, mostly Rajput community people had blocked roads, and indulged in arson in many districts of Rajasthan. 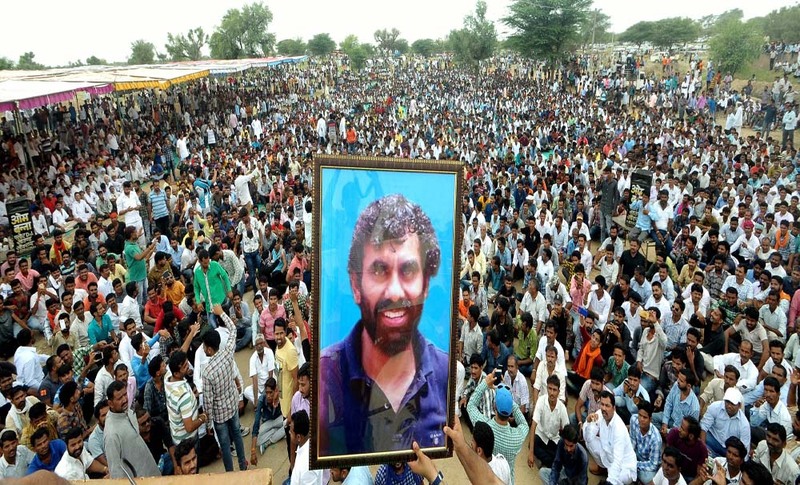 On July 12, thousands from the Rajput community including large number of women gathered to pay homage, to the gangster, who was considered Robinhood in the area. Anand Pal has two daughters and wife, and had 37 cases against him, including six of murders. One of his daughter studies in Dubai and the other in Pune. According to Rajasthan police, he had amassed a huge property. Since Anand Pal was encountered, there has been a huge protest, right from road to social media. In 2015, he had escaped from jail, and had Rs 5 lakhs reward on him.